Before you begin decluttering, please understand that you are never behind on this challenge. Just start wherever you are and make progress. But, I’m determined not to give up. Finally getting Christmas decorations neatly back in storage felt great. Plus my house is pretty clean and my laundry currently feels manageable, so I’m excited to dig in this week and do a little decluttering! Today I’m going to give you declutter tips, plus your next challenge. Please don’t feel any pressure to work on the exact room I suggest – clean the room that seems easiest to you, the room that’s bothering you the most, the first room company sees, or any other room you want. The order doesn’t matter nearly as much as just starting somewhere and making progress. Turn the TV off, turn some upbeat music on, put your phone on silent, and make sure your kids have an activity to keep themselves occupied. You’ll need plenty of trash bags, a sharpie if you have one (to write on the trash bags), a few laundry baskets or boxes, and several small storage containers (we use sandwich and gallon size zip top bags plus a few shoe boxes). 3) Find an accountability partner. Share your struggles and successes with someone. A relative or a friend would be great. You can also leave comments on these posts and gain support right here on my blog! 4) Have a basic cleaning schedule in mind. For example, when I decluttered my home last year, I gave myself assignments each week, then broke the assignments into three days per week (Monday, Wednesday, and Friday). This didn’t always work out perfectly, as life happens, but having a detailed schedule in mind helped significantly in staying somewhat on track. Hallway before removing donation items. 5) Remember that we don’t need as much stuff as we think we need. If you haven’t used an item in a year, then you probably don’t need to keep it. Other than maternity clothes and baby items (if you’re planning on having more children), when you come across things you haven’t used in a year or more, just get rid of them! Free yourself and your home of items that are no longer being used. 6) Know that if somebody hasn’t missed it yet, they probably won’t. If a toy has been missing under a clutter pile for the past six months and the kids haven’t even noticed, toss it. 7) Focus on one area at a time. Clean one dresser drawer, one cabinet shelf, and one corner at a time. If you’re new to successful decluttering, do not even try to accomplish an entire room at once! You’ll likely pull everything out, have a huge mess, then wander away feeling entirely overwhelmed and defeated. Focus on one area and don’t leave until it’s finished. “Put away elsewhere” (items that belong in a different room of your house), “Donate,” and “Trash.” Use the trash and donate bags liberally! 9) Remember this is a marathon, not a sprint. Don’t burn yourself out. You still have dinner to cook, laundry to fold, and a myriad of other responsibilities. 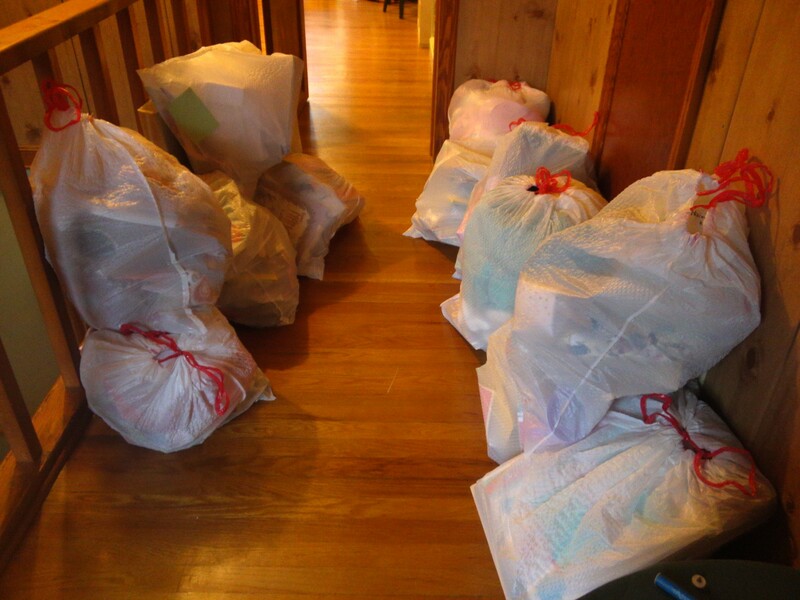 If you plan so much decluttering that you crash and burn after 2 days, you’re sabotaging yourself and your home. Pace yourself. The less there is, the less there is to clean. The less stuff there is, the more space there is. Hallway after removing donation items. Don’t focus on an entire room, or even an entire dresser, if it’s too much for you. Just focus on one hour and one drawer at a time. You can do this. Your home can be beautiful. This week’s assignment is to declutter your living room and family room. You’ll have a full week to complete these rooms, but don’t wait until the last day! Start now and pace yourself. Clean off the coffee table one day. Clean out the entry closet another day. Purge items in your entertainment center on a different day. If you happen to have those areas fairly under control, also complete a clutter task you’ve been putting off such as cleaning out a closet, a cabinet, or a clutter pile on the floor. What about you? What rooms do you plan on decluttering this week? PS Don’t forget to e-mail your decluttering questions to me because I’m planning on answering as many of them as I can during this series!